BEIJING, China (CNN) -- Searching through the rubble of demolition sites across the 800-year-old capital of China, Li Songtang has unearthed a treasure trove of ancient relics. They include gate piers depicting Mongolians and the Han Chinese during the Yuan dynasty, a Buddhist carving that is more than 1,000 years old, and a Ming dynasty marble fish water tank. Li Songtang shows visitors some of his collection of Chinese antiquities. Li Songtang is neither museum curator nor antiques expert, but an ordinary man who did not want to see China's rich history lost to modernization during the late 1970s. "I used to sit on the stone gate piers in front of our family home and recite poems. They were like my little friends," said the 60-year-old Beijing native who, like many Chinese, used to live in homes decorated with stone carvings, some of them ancient. When he saw some old sculptures being smashed, "I felt like they have been killed. I was very sad." Li said he thought he should put what was being deemed as "city trash" in a "grand hall," so he set up a museum in a home with a courtyard that he owns. He spends every Sunday in the museum that now houses 5,000 pieces, talking to people about the art and value of the sculptures. "This tells the 'Chasing Han Xin under the moonlight' story," he said of one relic. "This is a horse stepping stone from the Yuan dynasty. There are few relics from the Yuan dynasty (1279-1368). This is the best courtyard in China, and it is free to visit." Li began to rescue the artwork at the end of the 1970s, which marked the start of China's economic reform and opening up. "I was especially busy at the beginning of the reform and opening, and collected some great stuff. Whole sets of brick carvings and screen walls were rescued by me. You could see demolition signs everywhere if you rode a bike across Beijing," he said. "There was no need to hunt for a demolishing site, every Beijinger knew. The whole city was being torn down. When they were dismantling one district or one street, I would go and check it out." Most of the demolition workers at the sites were happy to give Li a hand for a small fee. "The workers do not care," Li said. "They tear houses down as long as they are getting paid for it. They know nothing about the value. They only think that these are nice, and it would be a pity to discard them." Li's biggest challenge has been the local police, who would prevent him from taking away the sculptures. "Sometimes after a house has been torn down for a long time, I get a trolley for 50 yuan (US $8) and go to collect the gate piers and the brick carvings. Within no time, the police would come: 'What are you doing here? Do you own these things? Are you going to steal those antiques? Put them down!'" "They usually end up taking the antiques away," he said. Li said he was no longer worried about the police, because according to him, there were no more valuable items to save in the capital. "If this street was taken down today, there would be nothing to protect. Now Xidan (an area in central Beijing) is to be dismantled, too -- for the military parade of the 60th National Day anniversary (in October). I went over the other day and only collected a pile of small gate piers -- and they were broken." 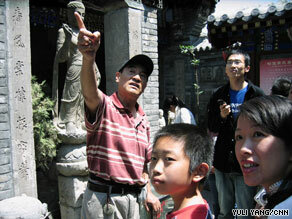 Old Beijing had more than 920,000 sets of private residences and between 7,000 and 8,000 hutongs, or little alleys. "Now they are all gone. Ninety percent of the private residences are gone. There used to be at least 3,000 temples in old Beijing. Now more than 95 percent of the temples are gone," said Li, who also founded and runs the first End of Life Care Hospital in China, which currently accommodates 367 elderly people. Liu Weidong, a respected antique verification expert at the Beijing Stone Sculpture Art Museum, reviewed Li's collection and said some of the sculptures were more than 1,000 years old. "After years of studies, I started to understand that we have to turn to personal collections," he said. "The government doesn't have enough capacity, awareness and respect to protect these things. I think the government should encourage personal collections and protections of antiques. This would be good for these antiques." The courtyard of Li's museum is free for all, while the ticket price to the indoor collection is 30 yuan (US $4.40). The ticket revenues do not cover the museum operations, so Li subsidizes it out of his own pocket. Standing on a doorstep paved with stones from the Qing Dynasty, Li recently talked animatedly with a small megaphone, trying to persuade a group of tourists to visit his museum. Some ten people walked in. "We found a sense of old Beijing here. The rest of the city has been modernized. We can hardly feel Beijing any more. Beijing is very different from what we imagined," said Yang Shujun, a visitor from Shanghai who brought his son to the museum. "Seeing all the relics is good for him to know about the 5,000 years of Chinese history." There are many wealthy antique collectors in China, but Li - who said he has never sold any items from his collection -- is the only one known for picking up relics from various demolition sites. "Beijing has the city wall from the Ming and Qing dynasties - why does it have to be torn down? If the old Beijing was left intact - 920,000 residences, so many temples, archways, screen walls - it would be the best museum of folk art in the world. Why taking everything down? I don't understand."